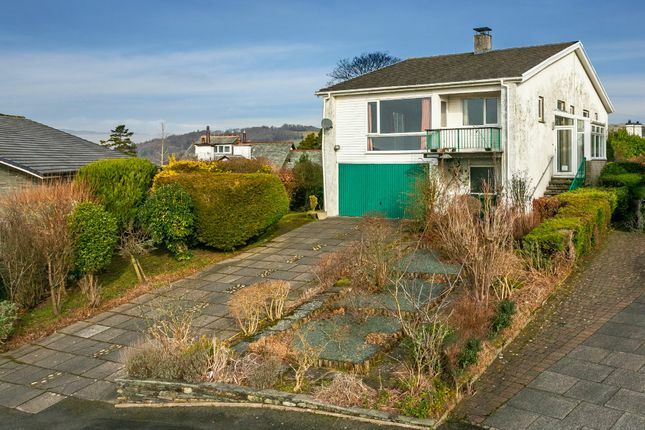 An excellent opportunity to purchase a detached house situated in the sought after Windermere Park Estate being one of the best positioned elevated plots with excellent far reaching views towards the mountains including The Langdales and Coniston Old Man and north along a stretch of Lake Windermere. Surrounded by generous gardens this spacious detached property has well proportioned accommodation offering four bedrooms, house bathroom, sitting room with a balcony benefiting from excellent views, dining room and kitchen, integral double garage with additional and expansive under croft storage and garden room. There is also a good size driveway to the front with parking for several vehicles and gardens surrounding the property enjoying plenty of privacy. The property now requires a scheme of renovation but does benefit from double glazed windows and gas central heating installed. This extremely sought after location and attractive proposition will appeal to a wide range of buyers ideally as a comfortable family home or retirement property offering fabulous elevated views from the bedrooms and living areas. Located in the sought after area of Windermere Park being a well regarded residential address of modern detached houses and bungalows only a ten minute walk from the shops, restaurants and amenities of both Windermere and Bowness villages with a bus stop at the end of the road providing links around the Lake District. Number 14 is located to the far end of a cul-de-sac in Windermere Park with convenient public footpaths and pleasant walks across open countryside to Brantfell, Matson Ground, School Knott and Post Knott and down to Windermere Village. The property is being sold with no forward chain. Directions From our Windermere office in Ellerthwaite Square, follow the New/Lake Road in the direction of Bowness. At the Police Station take a left turn onto Craig Walk and proceed up the hill taking the next left onto Meadow Road, follow along Meadow Road and take the second left hand turning into Windermere Park. No.14 is located towards the end of the cul-de-sac on the right hand side. Accommodation From the driveway, steps to the right hand side lead up to the front door and into the entrance porch. First Floor Designed to live mainly on the upper floor, a central hallway gives access to the living areas and three of the bedrooms. Living Room 21'2 x 14'8 (6044m x 4.48m) A splendid living space which has a large window and balcony to the southern aspect overlooking the front of the property and on the western elevation is a window which takes in a magnificent panoramic view of the mountains and Lake Windermere, including Coniston Old Man, The Langdales and Fairfield Horseshoe. The living room features a splendid open vaulted ceiling which is wooden clad and has a central gas fireplace. Dining Room/Study 10'6 x 9'6 (3.21m x 2.00m) Adjacent to the living room is a formal dining room with UPVC double glazed window out to the balcony. Kitchen 12'9 x 6'11 (3.89m x 2.10m) Fitted kitchen with an extensive range of wall and base units incorporating a range of built in appliances including oven, induction hob, fridge, sink and drainer and finished with laminate worktops and tiled walls. The kitchen benefits from a fantastic view of Lake Windermere and the fells beyond from a large double glazed window. Cloakroom Colour suite comprising of WC and pedestal wash basin. Space for hanging coats and UPVC double glazed window. Bedroom One 12'8 x 10'8 (3.85m x 3.26m) Generous double bedroom with windows on two sides enjoying splendid views to Lake Windermere and the fells and over the rear garden. The bedroom has fitted bedroom furniture and wardrobes. Bedroom Two 11'6 x 10'8 (3.50m x 3.26m) Double bedroom enjoying a aspect over the rear garden from three double glazed windows. Bedroom Three 10'10 x 7'9 (3.29m x 2.36m) Good size single bedroom with double glazed window. Bathroom Three piece suite comprising panelled bath with walk in facility, WC and pedestal wash basin. Large double glazed window taking in a superb view of Lake Windermere and the fells. Airing Cupboard Sliding doors and housing the hot water cylinder. Ground Floor Stairs lead down to inner hallway giving access to under stairs storage. Undercroft To the rear of the ground floor level are a series of undecorated store rooms, four in total consisting of a garden room with WC, utility area, shelved store and coal store. There is scope to convert these rooms into further accommodation. 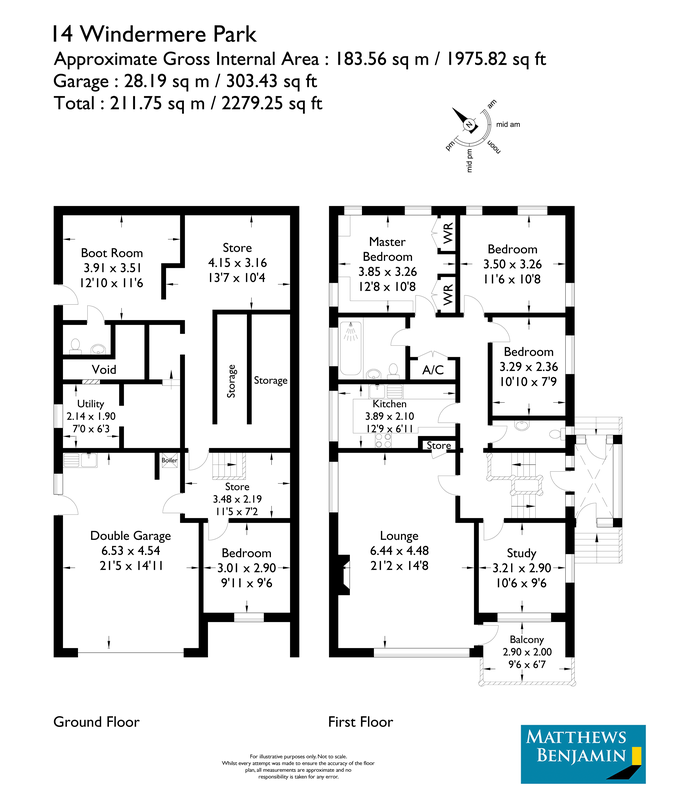 Integral Double Garage 21'5 x 14'11 (6.53m x 4.54m) Internal access leads into double garage which has a large electric up and over door as well as side UPVC door out to the garden. At the rear are a sink unit and the gas central heating boiler. Outside To the front of the property is a concrete slab driveway with parking for several cars with an adjacent area of raised stone planting beds. A pathway leads down the side of the property to the large garden at the rear has a number of raised beds and shrubs and a network of pathways leading to the lawn at the top. Tenure Freehold. The maintenance of the communal green/open areas on the Windermere Park estate is managed by the Windermere Park Residents Association, there is an annual charge for this which currently stands at £99.00.